On September 20th, Hon. Marilou McPhedran provided a statement in the Red Chamber identifying the efforts in Winnipeg by local civil society leaders. At the organization conference of the United Nations in San Francisco in 1945, the United States delegation invited Rotary International to appoint consultants. Candidates have until 31 May to submit applications to their district. Districts must submit endorsed applications to The Rotary Foundation by 1 July. On September 28, 2016 in his Sol Kanee lecture at the University Centre, University of Manitoba, Dr. Oscar Arias shared some little known history of Canada's role in helping Dr. Arias facilitate the achievement of Peace in Central America in the 1980's. In his address Dr. Arias gave special credit to Canada and its then Prime Minister Brian Mulroney and Foreign Affairs Minister Joe Clark for being two of five world leaders to help persuade President Ronald Regan to stop supporting the Contras, rebels in Nicaragara and allow Central America achieve peace on their own without interference by the USA and the USSR. Watch the full lecture on Youtube to learn how he achieved peace. When Israel Asper articulated his vision for aCanadian Museum for Human Rights in Winnipeg, it inspired Cam King and me, David G. Newman, Q.C., to champion the creation of Rotary International District 5550 World Peace PartnersCommittee in November of 2003. Speaking to a workshop of about 30 Rotarians, and in the presence of Native American speakers also presenting, Chief Stacey LaForme of the Mississaugas of the New Credit First Nation in Ontario uses poetry he has written and his historical narrative to convey with great power the impacts of assimilation and residential schools, racism and misunderstanding of Indigenous Peoples in Canada. “I believe an oppressed people remain oppressed unless there is confrontation or unless the other people [dominant society] evolve and value other people,” concluded Chief LaForme. They are adopting the Global Peace Indexdesigned and championed by Steve Killilea from Australia nine years ago. Positive Peace is defined by the index as attitudes, institutes and structures that create and sustain a peaceful society. Dr. Bernd Wollschlaeger told an impactful story about freeing himself from the burden of having a highly decorated Nazi officer as his father, who never acknowledged the atrocities he was part of and glorified. A raging alcoholic, his father would call those who did not agree with him, traitors. When Bernd was 14 years old in 1972, the Munich Olympics changed his life. After Israeli athletes were massacred by several gunmen, the truth about the Jewish genocide perpetrated by the Nazis was discussed for the first time in his school. Can NHL Hockey and a Human Rights Museum Coexist in Winnipeg? It was a historic event last year when Rotary International District 5550 World Peace Partners launched theRotary Adventures in Human Rights (RAHR 2015). It followed the highly successful University of Winnipeg Global College course Emerging Issues in Human Rights and represents the next building block towards peace, compassion and service above self amongst youth. (Rotary youth member Quinn Ferris reflects on his experience attending the Emerging Issues in Human Rights course in this recent CNC article: Youth as the future of world peace). Alongside the unveiling of the Rotary Adventures in Human Rights program, RAHR co-chair Irwin Kumka, embarked on a road show to Rotary Clubs in the district to garner support for the initiative. Bazzell Baz, a retired CIA field agent, founded a USA charity – the Association for Recovery of Children – when he chose to spend the rest of his life saving victims of child exploitation and human trafficking. 2003 rescue of Lilly Snyder, kidnapped from U.S. and taken to Costa Rica. As president of ARC, Baz recruits other retirees from the police, military and CIA to work with him in this volunteer effort of rescuing missing and exploited children whom authorities can’t find in the United States and in other parts of the world. While Canada waits to catch a glimpse of what is inside its newest national museum, Rebecca Deng is already cherishing her experience previewing the Canadian Museum for Human Rights. 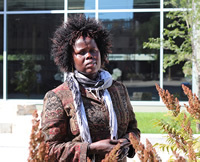 Deng’s tour this summer was included as part of the Adventures in Global Citizenship course at The University of Winnipeg’s Global College. A portion of the course took place in the museum with CMHR experts acting as guest faculty. “It really meant something, deep, deep inside for me, when I went in that museum,” says Deng, who, as a former child affected by war, one of the famed Lost Boys and Girls of South Sudan, knows about the importance of human rights.